Students prep for the FIRST Robotics Competition later this spring with the help of Gizmo CDA co-founder Barbara Mueller. Motors whiz and whir. The scent of fresh sawdust and hot metal waft through the air. Teenagers with safety glasses perched atop their heads confidently bustle around a shop that's filled with all manner of gadgets and machines: a laser cutter, plasma cutter, UV printer, lathes, CNC (computerized numerical control) machine, a 3-D printer and more. On Thursdays after school, Gizmo Coeur d'Alene is taken over by a dozen or so students on the local FIRST Robotics Competition team. The nonprofit makerspace — a do-it-yourself, creative learning lab offering use of its specialized equipment, tools and technology — is ground zero for coding, building and testing each component of the extracurricular project. Gizmo's team for the nationwide engineering and technology competition is open to students from all Coeur d'Alene-area high schools. FIRST Robotics' regional competition in Boise this spring is fast approaching, and the team needs to finish their robot by Feb. 23. Three-and-a-half weeks before that deadline, they conduct the first live test of the robot's motorized track wheels. So far, it's going well. "It moved, in low and high gear," one of the students excitedly reports to Gizmo co-founder Marty Mueller, the team's mentor. "I saw — that's great!" Mueller responds. At the competition, teams compete in various challenges — maneuvering the machine across uneven terrain, launching a projectile at a target and moving the robot up and over a vertical obstacle, explains Gizmo's Barb Mueller, Marty's wife. "The next couple of days will be a lot of 'first times,'" she says of the students' testing process. 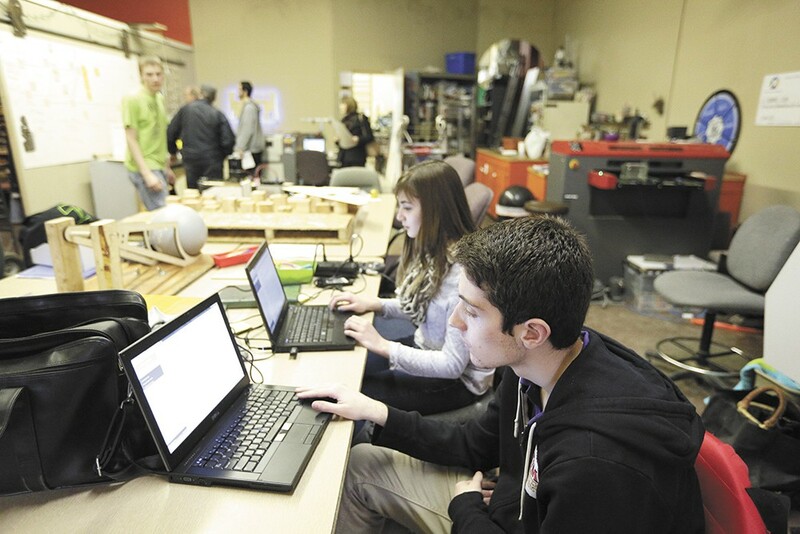 Students Joe Broader, right, and Crista Falk work on programming for the team's robot. The Muellers launched Gizmo almost two years ago, after decades working in the field of engineering research and design. The couple designed and built special IMAX cameras used in the International Space Station, which 20 years ago earned them an Academy Award in Scientific and Technology achievement. Those cameras became the basis for the 3-D technology used in the film industry today, Barb says. While now retired from MSM Designs, their Coeur d'Alene-based venture through which that project was developed, the couple are passionate about sharing their collective talents with the next generation of thinkers and builders. The robotics team challenge is one of the many creative, hands-on learning ventures that take place on any given day at the midtown Coeur d'Alene warehouse with a bright orange facade. Classes and workshops for all ages cover everything from metal welding and jewelry making to computer coding and woodworking. There's also a frequently rotating schedule of workshops and day camps especially for kids, giving the youngest learners a chance to explore Gizmo's diverse array of technology and tools. "There are makerspaces all over the country," Barb says. "Some are really kid-based, and some are really adult-based, but very few of those allow kids into the shop as early as we do. I think we're a good blend of kids and adults, and I think that's what makes us unique." During daily operating hours, makerspace members (varying rate tiers are offered) can drop in to use its equipment and resources, with the option to request assistance and advice from the Muellers and other experts willing to volunteer their knowledge on whatever project is underway. Gizmo was born out of original plans for an arts-focused space, Barb explains. At the time she was applying for grants to launch that envisioned arts hub; however, the civic planning venture CDA 2030 was also just getting started. Citizens and stakeholders involved in that endeavor were interested in bringing a makerspace to the Lake City. Mueller's plans shifted toward an arts-plus-technology resource; the makerspace that now serves all of Coeur d'Alene and beyond. "[A makerspace] allows all kinds of growth in tech, and it's also a place that could incubate ideas, bringing 'K through gray' in one space," Mueller recalls of those early discussions. Two short years later, she notes they've already outgrown the 3,000-square-foot warehouse. Everything in the shop that can move is on wheels to accommodate various sessions and projects, like the weekly "Muddy Mondays" pottery wheel classes and the Friday afternoon "Let's Science It" session for local homeschoolers. Marty built a rotating, vertical system to store materials in plastic storage bins — Gizmo's "tote-evator" — to save floor space. Gizmo could move to a larger home in as soon as a few months. With a professional career based in art and design — she's also a trained machinist — Barb stresses that Gizmo's mission is STEAM (the 'A' stands for arts) rather than STEM. The Muellers deeply believe, based on their own experiences, that creative, imaginative thinking and processes are critical to the STEM components: science, technology, engineering and math.